Check out these attention-getting, professionally designed postcards perfect for attracting new SFI Affiliates! Measuring a standard postcard size (4" x 6"), the SFI "Grow A Second Income" postcards feature a full-color, clean design with a glossy finish on side one and a plain finish on side two to prevent smearing when printing addresses and SFI Sponsor ID numbers. Each unit ordered includes 50 postcards. To use the postcard, just... 1. Print or stamp* your SFI ID number in the box located on side two. 2. Address the card (either by printing your recipient's name/address or by affixing a mailing label). 3. Add a postcard-rate postage stamp and drop in the mailbox. NOTE: Recipients of your postcards are instructed to join SFI FREE at www.SFIExtraIncome.com, where they will be asked to enter your SFI ID number. Upon entering your ID number, they'll see a special affiliate registration page designed especially for this postcard to create a clean, seamless affiliate sign-up process. You'll receive an instant e-mail notification each time someone joins SFI from your postcards so you can follow up. It's that easy to start generating new SFI Affiliates by direct mail! Tip 1: Need mailing lists for your postcards? Use your favorite search engine to find quality lists. Try searching for: "mailing list opportunity seekers" Tip 2: To fit the space provided on the postcard, you'll need labels that are no more than 2.25" wide (2" width or less preferred). NOTE: For a variety of garments and other promotional items you can use to promote SFI, CLICK HERE. You can also find additional items at our SFI CafePress store. *You can purchase a self-inking rubber stamp, customized with your SFI ID, from VistaPrint for as low as $12.99 here. YES, I'd like to pay just $5.65 now and set up this item for automatic monthly delivery. No obligation. Cancel anytime. Check out these attention-getting, professionally designed postcards perfect for attracting new SFI Affiliates! Measuring a standard postcard size (4" x 6"), the SFI "Grow A Second Income" postcards feature a full-color, clean design with a glossy finish on side one and a plain finish on side two to prevent smearing when printing addresses and SFI Sponsor ID numbers. Each unit ordered includes 50 postcards. 1. Print or stamp* your SFI ID number in the box located on side two. 2. Address the card (either by printing your recipient's name/address or by affixing a mailing label). 3. Add a postcard-rate postage stamp and drop in the mailbox. NOTE: Recipients of your postcards are instructed to join SFI FREE at www.SFIExtraIncome.com, where they will be asked to enter your SFI ID number. Upon entering your ID number, they'll see a special affiliate registration page designed especially for this postcard to create a clean, seamless affiliate sign-up process. You'll receive an instant e-mail notification each time someone joins SFI from your postcards so you can follow up. 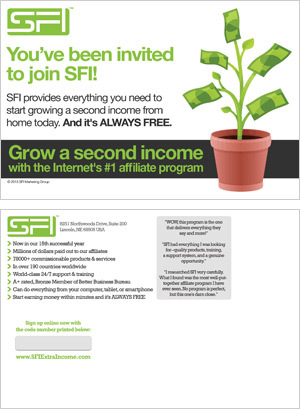 It's that easy to start generating new SFI Affiliates by direct mail! Tip 1: Need mailing lists for your postcards? Use your favorite search engine to find quality lists. Try searching for: "mailing list opportunity seekers"
Tip 2: To fit the space provided on the postcard, you'll need labels that are no more than 2.25" wide (2" width or less preferred).